Private lessons allow you to choose when and how often you learn. 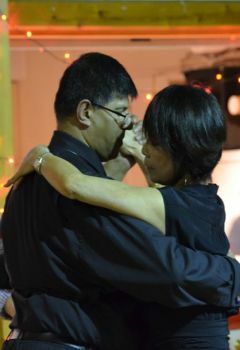 Some people choose to take private lessons because they want to learn more quickly, or because they want to get the basics of tango before they join a class. Sometimes people want to be able to dance at a celebration event. In private lessons we can teach you to dance and provide a simple choreography. We can even come and dance with you at the event! Private lessons can be for an individual, a couple or for 2-4 people and normally last an hour. Make your first dance one to remember. You choose the music and we will help you to shine on your special day. This can be a tango, or it might be a Latin or Ballroom dance as we are qualified to teach all of these. Flexible packages of lessons mean you can have as many or as few lessons as you need. We can also advise on music, or liaise with whoever is providing the music at your wedding reception.